Geology Peat infilled ice margin channel. 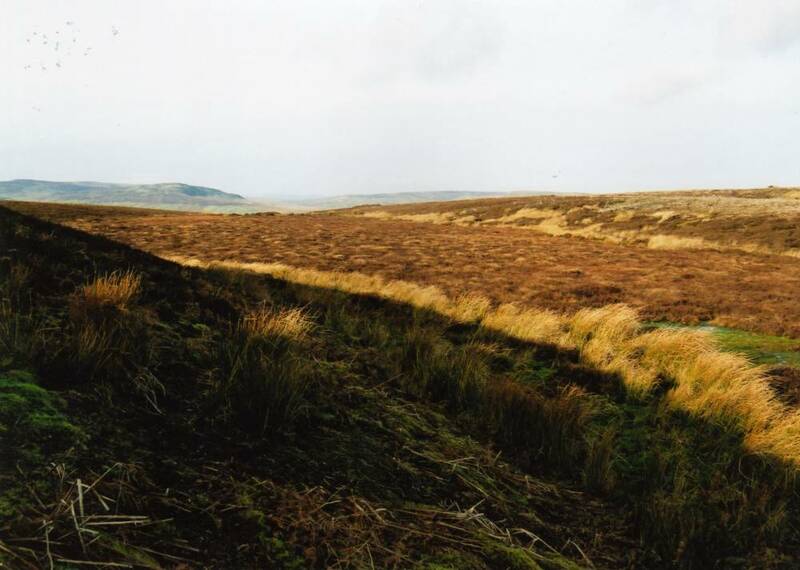 Record Description For location of Ellerton Moss, see photo ELL20.01, 02. 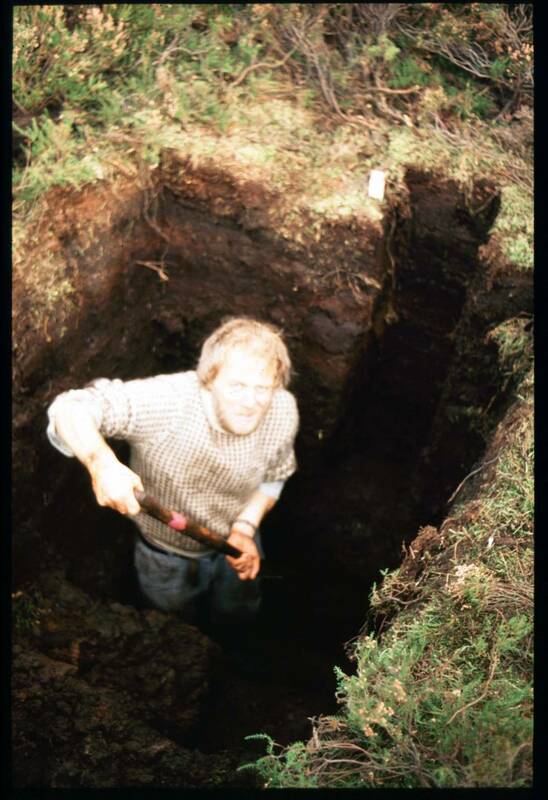 Peat block column cut from side of hand excavated pit to the base of the peat at 2.0m, with further samples taken through basal clay/silt by borer to a total depth of 2.6m. See Figures 1 and 2. 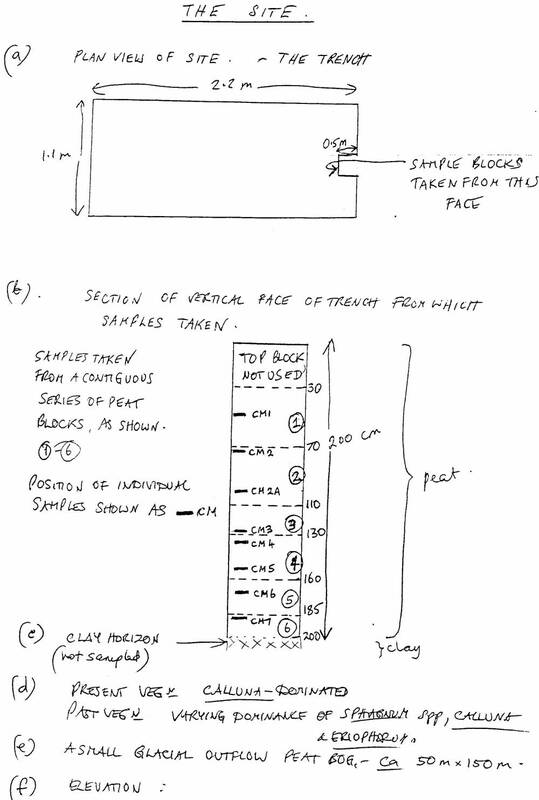 There appears to be some confusion as to the depth of the peat which is stated to be 2.6 (3.0mdeep including the silt) on the site description, Figure 1 and shown to be 2.0m on the section, Fig 2. 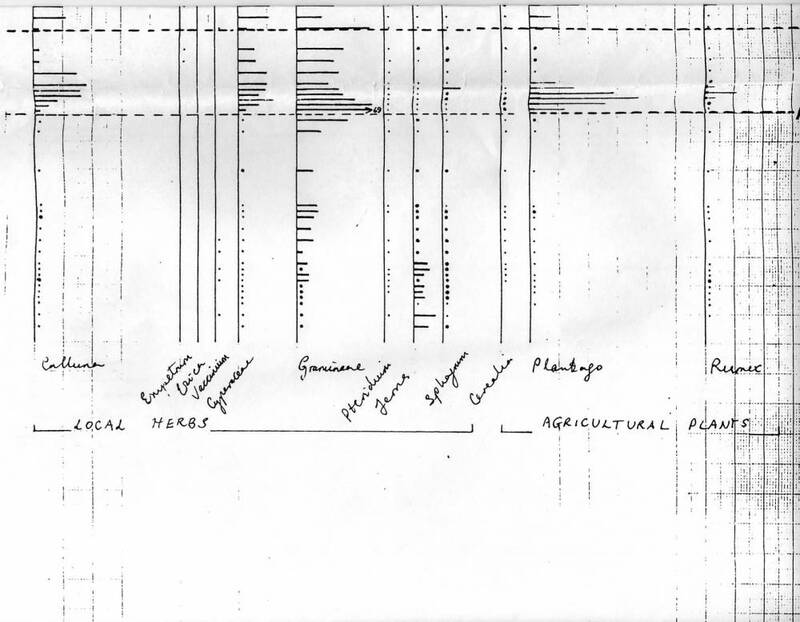 The total depth of the diagram is 2.6 which is assumed to include the basal silt, sampled by borer. 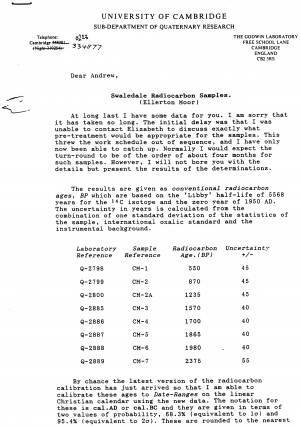 A total of seven C14 dates were commissioned, the lowest level, CM7 at 190m was radiocarbon dated to 2375BP (calBC590-360 at 95.4 pc probability). 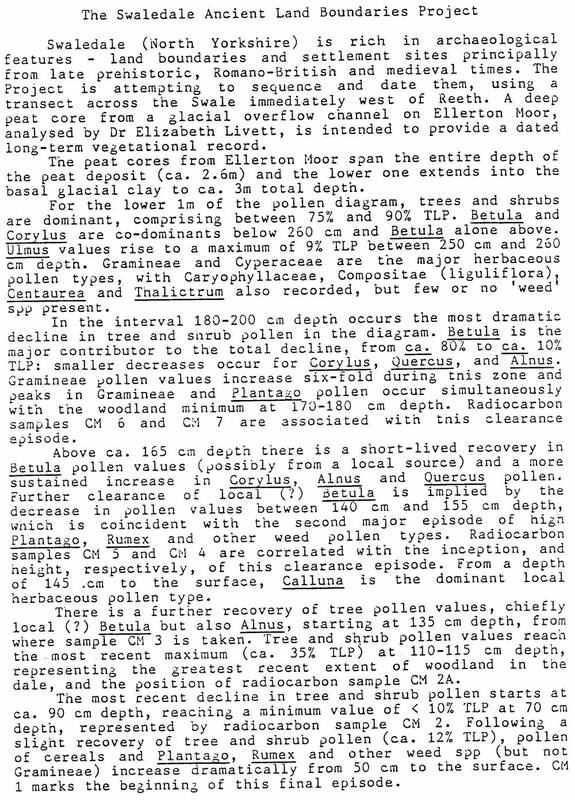 The significance of this Pollen Report is the identification of a very marked woodland clearance episode radiocarbon dated to around 500BC with a striking rise in grass and ribwort plantain (a weed of cultivation) pollen coupled with the decline in tree pollen. 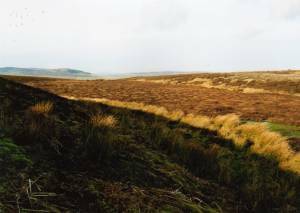 This would coincide with the full extension of the coaxial field systems across the whole of the upper slopes of Grinton Moor and of Harkerside. Heather, present only in small quantities,only becomes dominant at 100AD. 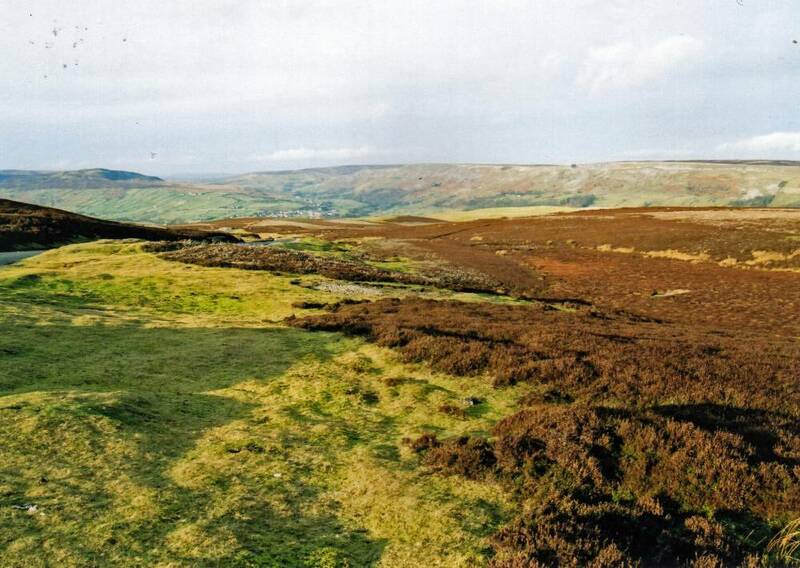 The concusion being that the upper slopes of Swaledale was managed pasture during the Prehistoric Iron Age with hedgerows (the coaxial field boundaries) and hedgerow trees- a parkland landscape- very different from the open heather moorland of today. 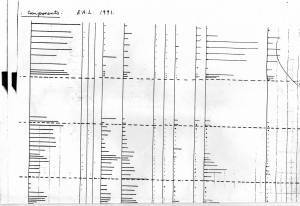 Additional Notes See Fleming 1998 pp138-140 for an analysis of this diagram.. 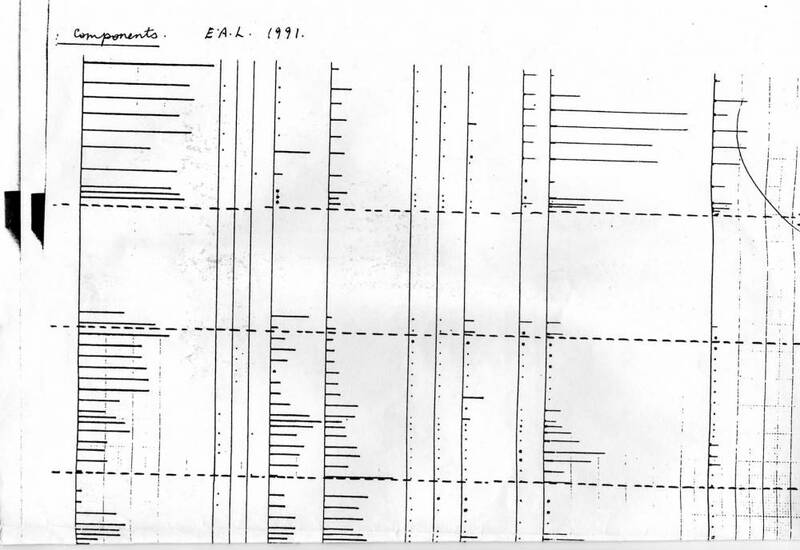 The seven C14 Dates (CM1-7) are listed on Figure 2. 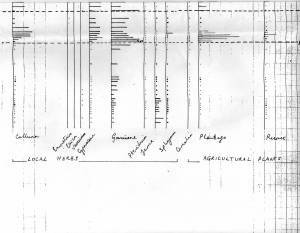 The main features of this C14 dated pollen report are: 1. Birch and hazel co-dominant at base. 2. Limestone woodland with elm, ash and abundant hazel may have developed on the screes below the Main Limestone at Sharrow Hill just 500m to the northwest. Hazel scrub may have been the dominant woodland above the limestone scarp of the plateau edge. 3. Birch remains are abundant at the base of eroding blanket peat at 475mOD at Grovebeck Moss 3km to the west. 4. 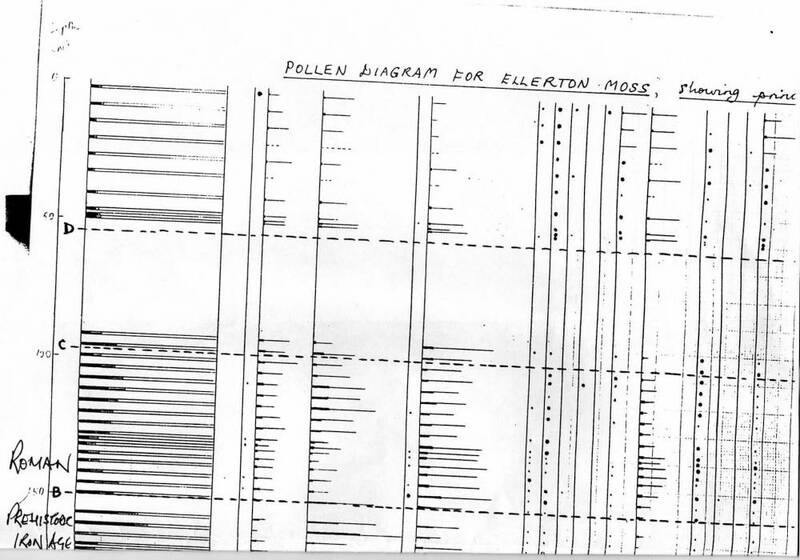 Elm pollen â€˜risesâ€™ to 9 percent of TLP at 2.6m-2.5m. This may indicate that the base of the peat is post elm decline. 5. 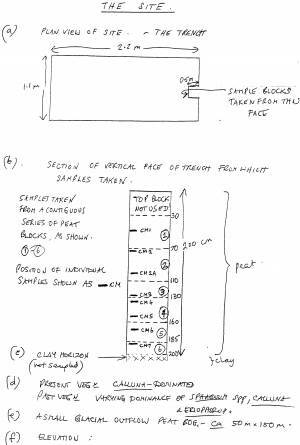 Continuous records of lime from 2.6m to 2.2m is of interest and lime may also have been present at Sharrow Hill. T. platyphyllos survives today at 290m OD on limestone at Whitcliffe Scar. 6. The linden is insect pollinated and its pollen may be underrepresented. It is strongly thermophilous, responding to climate change and was abundant during the Sub-boreal Pollen Zone. 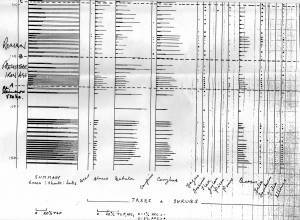 Indicating that the basal silts were open water during the Neolithic-bronze age. 7. The presence of cereal pollen in the basal silts, indicating arable activity close by during the Bronze Age is of great interest, in that: 8. The recently discovered ring cairn, clearance cairns, field banks and structures (ELL21) characteristic of Bronze Age settlement activity on rising ground immediately north of Ellerton Moss within 100m of the pollen site was not recognised when the Ellerton Moss pollen sample was taken.. 9. The possible grain of Fagopyrum (Buckwheat) at a Late Iron Age/Roman level was of interest and has few British records from this period. 10. 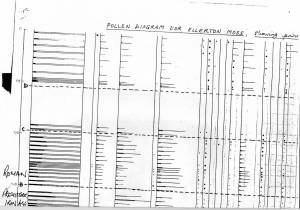 The clearance episode from 1.8m depth radiocarbon dated to around 500BC is notable inthe steep rise in grassland with cereal pollen and also of the well known eed of cultivation, ribwort plantain (Plantago lanceolata). 11. 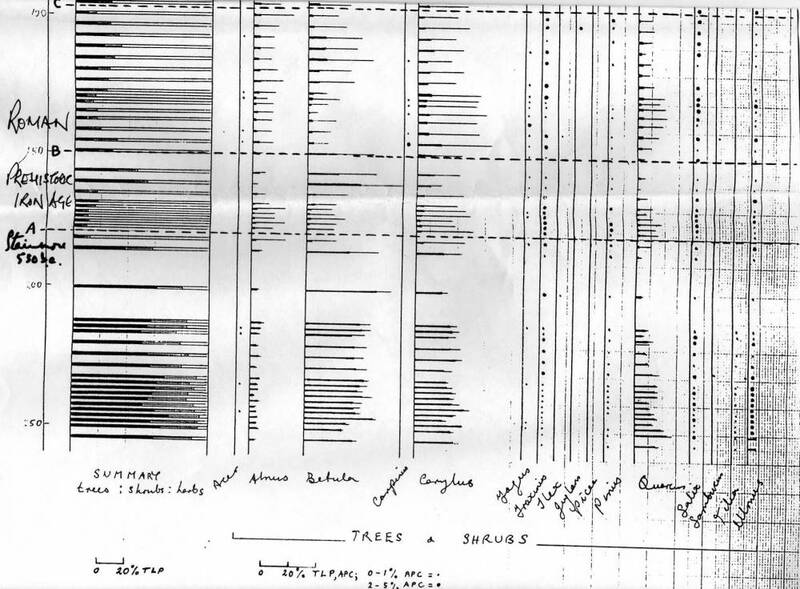 The most striking aspect of this, the first C14 dated pollen diagram from the levels of the coaxial field systems is that the heather dominated landscape of today was not present until the Roman Period. Prior to the 1st Century AD, the upper slopes of Swaledale (and the managed coaxial fields) were open grassland with hedgerow trees (eg field maple present). Hazel rich ash woodland would persist on the limestone scars. 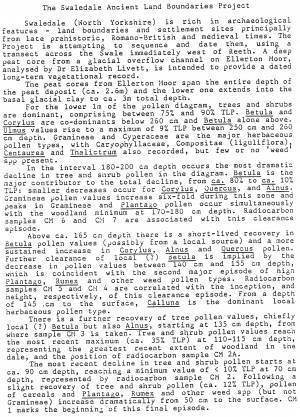 Image 1 Description Ellerton Moor Pollen Site. The peat infilled ice margin channel. 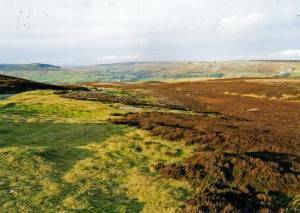 View towards Reeth and Calver Hill. Image 2 Description Ellerton Moor Pollen Site. The peat infilled ice margin channel. Image 3 Description Andrew Fleming telling me that it is my (TCL) turn with the spade. 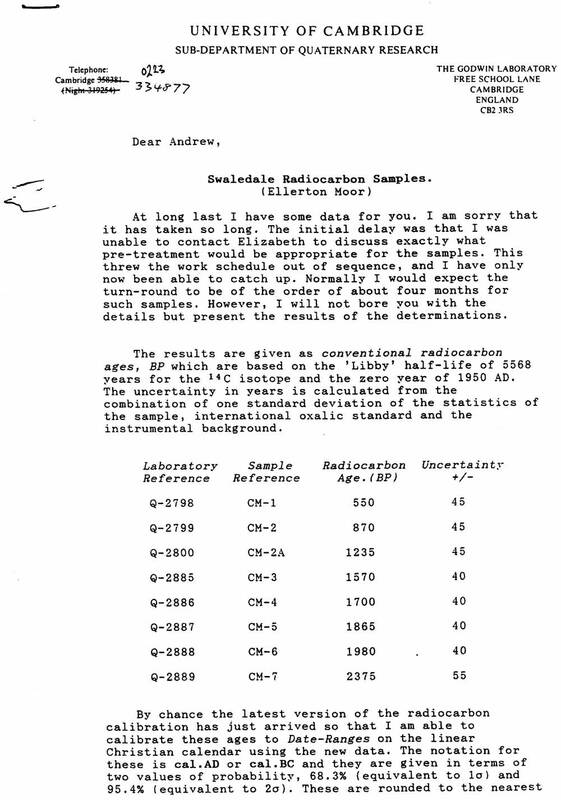 Image 5 Description The Radiocarbon Dates.